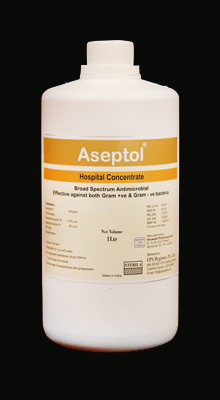 Aseptol is a multipurpose disinfectant, that can be used as a first aid for minor cuts, wounds etc. Broad spectrum anti-microbial, effective against commonly occurring bacteria, fungi and viruses including HIV. Effective in presence of pus and blood. Dilute one (1) part by volume with fifteen (15) parts of water. Always use freshly prepared solution. Multipurpose disinfectant: Surface cleaning, general purpose disinfectant. B-508, Shivparvati Apt., Satya Nagar,Saibaba Mandir Road, Borivali (W), Mumbai - 400092, Maharashtra, India.